NOTES: Advantages: Extremely detailed, loads of options, instrument panels in colored photo etch, excellent loadout for CURRENT Spirit. Disadvantages: clear parts not smoked, panel lines too deep, closed options not denoted in the instructions, really long wingspan. The flying wing concept was started by the visionary mind of one Jack Northrop. Jack had always been the champion of the flying wing concept, thinking it’s the next step in the evolution of flight. To this end, he produced such aircrafts such as the N-1M and N-9M. After WWII, Jack eventually would produce both the YB-35 and YB-49 flying wing bombers that were way ahead of their time to compete for the USAF next generation bomber. Both eventually lost out to the more conventional B-36 Peacemaker. Simply put, the concept needs another 20 years of development, and especially the advent of fly-by-wire control to solve the flying wing’s inherent stability problems before it can become fruition. Some 20 years later, somewhere in Lockheed famous Skunk Works, a newfangled thing called “stealth” was being developed, which eventually resulted in the F-117 Nighthawk. With the F-117 predecessor the “Have Blue” soon having its way with any radars then in existence, the Air Force quickly went out and called for a bomber with the same capabilities. The Advanced Tactical Bomber concept was born and Lockheed and Northrop quickly signed up to develop the ATB bomber. Both teams were selected as the final participants. The eventual plans for both would be flying wings. At this point, it turns out, the flying wing concept is inherently very stealthy. Without a fuselage to reflect radar waves back to the source, it already cut down its important RCS, or Radar Cross Section. The Northrop concept was eventually selected as the winner since it’s larger and did not have a tail. A mission change from high altitude to low altitude delayed the program for 2 years and added over 1 billion dollars to the program costs. The total program costs would be over 23 billion in then 1980’s dollars. The new bomber would be subsonic, utilizes stealth to its limit for protection. It would feature a complete flying wing without any fuselage or tail appendages. To enhance stealth, no protrusion whatsoever would be present on the outside of the bomber. The four General Electric F-118, modified F-404 powerplants that powered the F/A-18 Hornets with non-afterburner features are buried deep inside the “fuselage”, with their intakes and exhaust pipes bent into a “double s” trunks so that radar waves can’t get a direct look at the engine fan faces and to reduce the exhaust heat signature. The tail features a double W zigzag pattern so again, radar waves will be bounced ever which way except to its source. The entire airframe would be covered in Radar Absorbent Materials or RAM to further reduce its RCS to the point on radar, the B-2 would be a size of small duck. It’s main mission then was to carry a bunch of B-61 thermonuclear weapon or nuclear tipped SRAM or other missiles within its belly, and when the “go” order came, it would fly low, ducking through the layers of deadly Soviet air defense networks created by its stealth coating, either destroy Soviet cities or hunt down deadly roving Russian mobile ICBM’s on their wheeled TEL Tractor, Erector, Launcher trailers. Thank goodness this never came to pass. The bomber was fully revealed to the press and public in 1988. Before that though, in a secret meeting, a present was offered to the now late Jack Northrop. By 1981, Jack was dying of cancer and other illnesses. When Northrop beat Lockheed with their winning design proposal, Jack was wheeled to a secret room in his hospital. Various illness has left him unable to walk, talk, or speak. In that room, in total secrecy, Jack was allowed to view various design plans for the initial B-2 concept, now called “Spirit”. Finally, the box in front of him was opened and a model of the initial B-2 was presented infront of him. Jack, unable to talk at this point, wrote on a piece of paper, “now I know why God has kept me alive all these years”. As the B-2 designer remembered, as Jack caressed the model with trembling hands, you can see in his eyes all the histories of the flying wing and him flashing in his mind. Jack Northrop would die 10 months later on February 18th 1981. Originally, some 165 stealth bombers would be ordered at a cost of some 1 billion dollar each….Which is quite the lie since this tag includes all the research and development costs and thus, should be counted as “sunk” costs and not included in the production cost. But to the press, hey it sounds better so the Spirit became the “billion dollar bomber”. Controversy flew even further when just 2 years later, the good ol’ USSR decided to collapse on itself and ceased to exist. All of a sudden, the Cold War was over and one of the most urgent and primary mission of the B-2 ceased to exist. Calls for its cancellation started to be called out. Eventually, cooler heads prevailed as the B-2, with its stealth, could still go to places that the B-52 and B-1B cannot hope to even think about. In early 1990’s, then President Bush the elder ordered 20 Spirits, down from the original 165 into production. Clinton later added a research and development machine to the mix, spending 500 million to convert it to operational status to bring the total to 21 operational aircrafts. After entering service, the machines immediately saw upgrades and improvements. The most urgent was to give it something else to do other than waiting, now it seems, for an Armageddon that would never come. To this end, the bombers were all modified to drop conventional weapons including up to 85 500lbs JDAMS smart munitions or up to 16 2000LBS JDAMS on rotary launchers inside the two massive bomb bays. All weapons are held internally since external weapons destroys the bomber’s stealth signature. Currently, all operational B-2’, sans one that crashed on Guam in 2008, are slowly being upgraded to Block 30 status, causing all them to operate the latest nuclear weapons to the smallest conventional smart weapon, the SBD, to the largest conventional weapon ever, the MOP, Massive Ordnance Penetrator bomb designed to penetrate as much 20 feet of steel reinforced concrete. Only two of these massive weapons can be carried, on in each weapon bay. The plane’s operational debut happened during the 1998 Kosovo assault. Operating under the code name “Vader”, yes, as in Darth Vader…And from the front, the plane does look a bit like the infamous dark lord of the Sith, the bombers accounted for 33% of all bombs dropped in the first week of the war. Flying nonstop from Whiteman AFB in Missouri, the home of all the stealth bombers, it took 30 hours for the bombers to fly to Kosovo and back. The Spirit accounted for 11% of all bombs dropped in the whole war, including 5 JDAM’s which took out the Chinese embassy in Belgrade. The next war saw B-2’s serving in Afghanistan, including the longest bombing mission flown by an aircraft nonstop from Whiteman to the country itself. This was followed by strikes during Operating Enduring Freedom and strikes in Libya. There was a plan to kill Bin Laden with the Spirit by having one fly out of Whiteman and bomb Bin Laden’s compound with concrete busting bombs. However, this plan was dropped because of worries of civilian casualties and the fact it would be very hard to identify whether Osama would be killed or not. Eventually of course, a SEAL team would go in and kill him instead. The Spirit is currently scheduled to serve all the way until 2032 or so. Previous plans were to have it serve until 2056. However, with the advent of the B-21 Raider, the Air Force decided to slowly phase out the Spirit since as a second generation stealth (F-117 was the first), it has several shortcomings, the least of which is its RAM coating, which, as a second generation one, requires massive and intense maintenance in climate controlled hangers in order to be utilized heavily and like the coating on the F-117, if not used correctly, can become extremely toxic. The B-21 Raider will go a long way to solve these problems, or so they say. It seems these days, another new Chinese company would pop up offering something something that modelers has desired for quite sometimes now. Well, I do think many of them do fall under one main umbrella though, just like how Wasan Plastic Company owns Trumpeter and Hobbyboss. So, it could be that Modelcollect falls under another company since this one does nothing it seems, but 1/72 kits. They already do B-52’s, including the G and H versions that offers quite the alternatives from the older Italieri/AMT kit and the ancient Monogram/Revel. 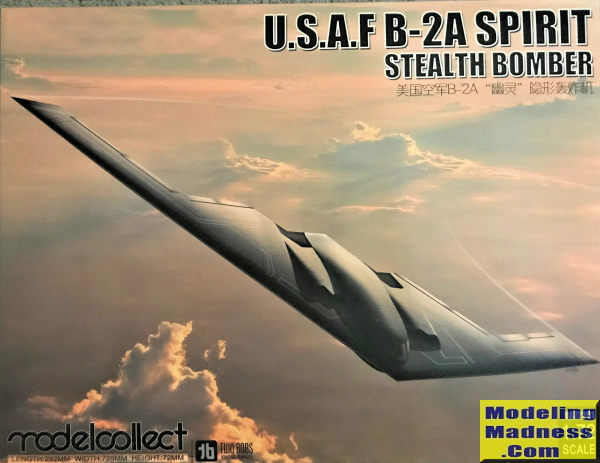 This time, they offered something many modelers have wanted for a long time, a B-2A in 1/72 scale. So, what does this offer? Well, first of all, nearly 30 years of improvement in molding technology later, the fit of this kit is so much better it’s not even funny! 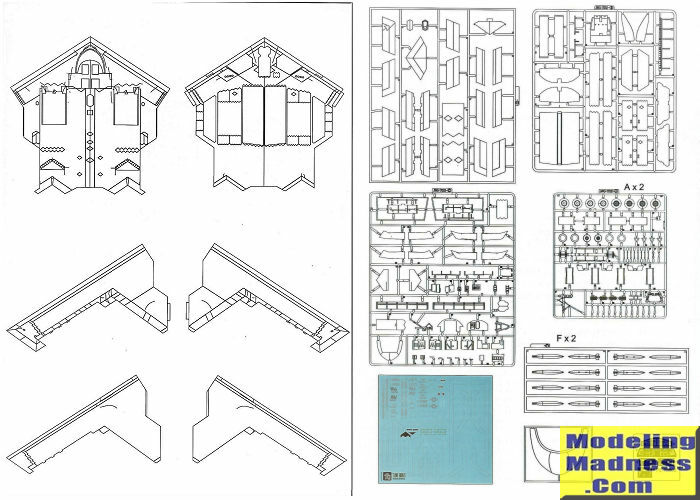 The “fuselage” and the wings are in different pieces….There is no way to get around that cause just like the ancient Testor’s kit, if you try to mold something that wide, the plastic simply will not hold without warping. But testing them out, the fit is superb and the connection lines are all on panel lines so very little filler if any are needed to bring this up to speed. The second would be the details. Nearly 30 years later, many parts of the plane are now declassified. It’s obvious that Modelcollect designers had a chance to view all sorts of photos on the cockpit, the wheel wells, and the main weapon bays. If you tell me they also got a chance to crawl over one, I would not be surprised since these areas are now open to the public. Many of the parts on offering in this kit previously, was only available from the like of Eduard and far more accurate. The cockpit alone features over 20 pieces, including thank goodness already colored photo-etch instrument panels and looks great when finished although you won’t able to see much of it through the clear windscreen. A minor quibble on the windscreen, it is clear. After F-117, all U.S. aircraft eventually were modified with what look like a golden/blackened hue on the canopies/windscreens. This coating is important, especially for a stealth aircraft as it allows radar waves to “bleed” in, but never out, thus preserving the aircraft’s stealth characteristics. Without it, for example, on the F-117, even the pilot’s helmet will double the plane’s RCS! You can add a coating by using Tamiya’s smoke. The same is now carried to the weapon bays and the wheel wells. The weapon bays now features both bulkheads with the correct curving top and the rib details. The bay contains two rotary launchers with 16 2000lbs JDAM rounds, a far more realistic loadout for today. It also contains details such as the windshields and the bay doors actuator rods that are all missing from the Testor kits. The wheel bays are the same with far more detailed and accurate main and nose struts and wheels and the crew boarding hatch that are missing from the Testor kit is also included here. The rest of the kit all feature this type of work. The intakes, the top has the extra air bleed in openings, the kit features four somewhat detailed F118 engines with their associated “S” pipe intake trunking and exhaust pipes. The engines can be displayed in the maintenance bays if you wish. The top also contains the inflight refueling door with both the open and closed doors offered. All control surfaces are separated so you can pose them opened or closed. The only quibble I have is that all the opening stuff, the bomb bay doors, the wheel well doors, the crew entry hatch, the engine maintenance bay doors are designed to be either open or closed since a small picture will denote the “closed” option when the steps come to that point….However, just how do you do the “Close d” option is never explained in the instructions, only the “Open” option. So if you follow the instructions to the letter, your only option will be the “Open” option….I’ve already read the instructions 4 times now and have a good idea how the closed bays/doors work but this is annoying to say the least! Wish the manufacture, when given us the option for both open or closed, give us distinct instruction on how to carry them out! 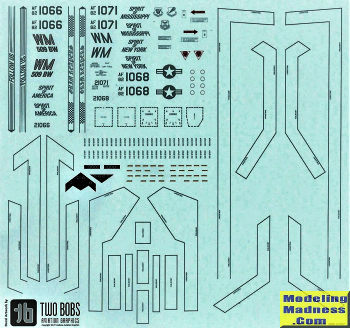 The only other quibble will be the size….The length is nothing…It’s about the size of a 1/72 scale SU-27 Flanker or a 1/48 F-15…….The width or wingspan on the other hand is no slouch at 29 inches wide so get some real estate! Three markings are offered, the Spirit of America, New York, and Mississippi. All Spirits are named after Spirit of “State”…Get it? Except the Spirit of Kitty Hawk. Wonder if there are markings available for Spirit of Ohio or Georgia…..
Well, ANOTHER project on the front burner!!!! Sigh, it gets add up does it? Anyway, first thing first though, I’ll be needing to get a few more bottles of Gunship Grey for this bird and figure out on how to close all the doors. This one will be all closed up, with two crew figures…I’m seriously thinking about buying a second one. That one will be without the crew, and everything opened up….Yes, the kit is good enough that getting two is now a serious consideration!